I believe that if, at the end of it all, according to our abilities, we have done something to make others a little happier, and something to make ourselves a little happier, that is about the best we can do. To make others less happy is a crime. To make ourselves unhappy is where all crime starts. We must try to contribute joy to the world. That is true no matter what our problems, our health, our circumstances. We must try. I didn’t always know this and am happy I lived long enough to find it out. 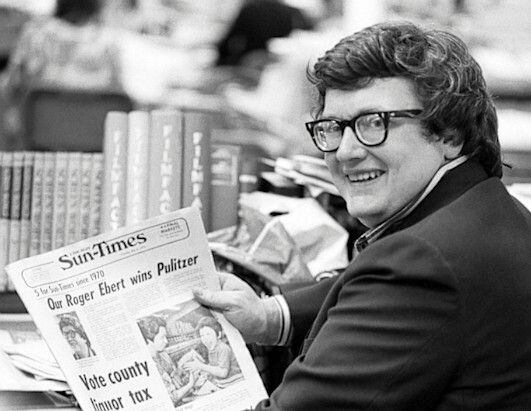 Roger Ebert, newspaper man, movie man and spectacles wearer extraordinaire. That is one of the many wise, simple, and inspiring things written by Roger Ebert, the great film critic who died yesterday at the age of 70, and was one of my great personal inspirations. The first ever recipient of the Pulitzer Prize for film criticism in 1975, Ebert to many was more than just the rotund, bespectacled gentleman arguing about movies on TV and writing his thoughts on every single movie that ever came out during his tenure as Chicago Sun-Times film critic. So he was to myself as well, before I became a snarky guy on the internet writing about people with funny names. Somewhere in my early teens I figured out that my big passion was going to be movies, much like Mr. Ebert’s was. As the internet started becoming popular, displacing newspapers, and allowing everyone and their mother to call themselves a “film critic”, you could imagine Ebert would have gone on the defensive and dismissed the internet like many did. 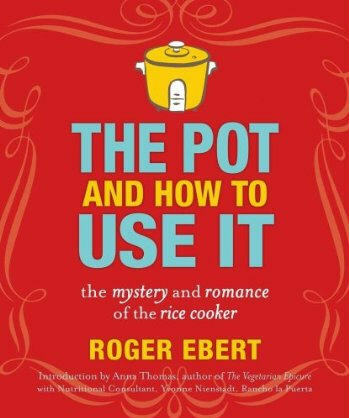 We love cookbook authors on this blog, but Ebert might be the only one who wrote his book when he could no longer eat because of his illness. Instead, he did the exact opposite and embraced the web, the early “self-made” critics, and made himself available for those asking for his help and guidance. There’s a reason no other critic I can think of could have inspired eulogies like this one (a great read that, from Berge Garabedian, one of those self-made online critics himself). Few people inspired my love of film as much as those two great sirs did with their writing. He was a classy guy, and later his RogerEbert.com film review archives and especially his personal blog there showed exactly why the internet can be so great. In his blog he would eloquently expand on everything from his recovery from alcoholism, and where to go walking in London, to why the theory of evolution was his second greatest belief beyond the elevating power of movies. It was a pleasure and always an education to read his thoughts. He even wrote a cookbook on making meals with a rice cooker. He was no stranger to funny names either, married as he was to Charlie “Chaz” Hammer-Smith. He also co-wrote a few trashy exploitation movies with the legendary Russ Meyer in the 70’s, including Beyond the Valley of the Dolls, which features characters with names like Z-Man Barzell and Petronella Danforth, who was part of the all-girl band at the center of the film named The Carrie Nations. After the film was received, shall we say poorly, he made two more films with Meyer, this time under the pseudonym Reinhold Timme. Mr. Ebert (Mr. Timme), good luck in the next world. You will be missed but at least we can always read your delicious put-down of Rob Schneider and Deuce Bigalow. That will never die. Moving on to our more traditional lineup of funny names in the news. Our Intrepid Important Person Correspondent Amb brings us the news that she received a copy of Vogue magazine in something she described to me as an Easterween basket. As I am entirely square and out-of-loops, I don’t know what this could possible mean, but her assurance that it led her to discover the opera singer Pretty Yende, as well as some lingerie, does bring me great comfort. As our Sports/Hamburger Correspondent Dave reminds me, High School basketball features an annual celebration of the best players called the McDonald’s All-American Game. That’s kind of funny in itself, McDonald’s happily sponsoring actual exercise, but even better, the game featured not one, but two kids named Jabari, Jabari Bird and Jabari Parker. And that’s just wonderful. Dave also points out that Jabari Parker is the son of former NBA baller Sonny Parker, making him the Son of Sonny. This has been our expanded/contracted Funny Names in the News Roundup for this week. Be well! This entry was posted in Funny Names In The News and tagged funny, funny names, humor, movies, news, rip, roger ebert. Bookmark the permalink. I just love that quote of Ebert’s that you opened with! Fabulous job as always, my friend. Yeah, when I saw it as part of the stream of eulogies I had to open with it. Of course, my writing reflected against that doesn’t seem so grand (I’m not as good when I limit my puns) but I felt the need the need to write about him anyway. It was earnest pun-limitation week here I guess after Dave’s Monday post. It’s been an interesting, but good week. Nice tribute. Awesome, Arto. Nicely done–all. You will not be surprised that I have his cookbook on my shelf and love reading it not because I have a rice cooker (or even care much about rice) but because he was such a strong writer. He writes a cookbook, though he can’t eat. How is that not genius? Funny about your opening quote: Was having some of those thoughts yesterday–the “why am I here” sort. Ebert, bless his beautiful soul, summed it up perfectly. And yes, you never know what will turn up in an Easterween basket. Have a great weekend–you’ve earned it. It all makes sense now! I should’ve known that be in the loop on all things Amb all I needed to do was click on over to WBS. D’oh! I had a sneaking suspicion you might be aware of the book – having it in your shelf though is pretty marvelous! I remember when he first wrote about the book in his blog, I wasn’t sure if he was joking or not, but there it is, a real rice cooker book. Those kinds of thoughts he offered always help, don’t they? That, or watching a real good movie. Or making an eggplant lasagne perhaps. yes! I kind of assumed you were in on this 😉 You pick the movie. Oh, goodie. I’m thinking something European, to go with our Italian fare … but nothing too European (we don’t want to make Arto blush). Hmm … How about “Letters to Juliet” starring Amanda Seyfried and Vanessa Redgrave? I’m good with that. Hope Arto has started that lasagna as it takes a while to cook through.